There are so many ways to mix up your training and keep things progressing and while most people have grasped the concept of increasing sets, reps, changing the tempo of the lifts or the the time of the “cardio”, frequency etc. there is a very simple and effective way to not only switch up your training, but also prevent overuse injuries. For sake of simplicity I will refer to “cardio” work to make my point here…most people get comfortable on one particular piece of cardio equipment and while they have finally learned that they must increase the intensity, time and even switch up the pieces of equipment used, these pieces of equipment all have you strictly working in the sagittal plane (forwards and backwards). I am not going to be another one of the people to bash equipment because there IS a place for it in anyones training program (like if you want to have an active rest day and like the gym environment…) but I will emphasize the fact that incorporating “work” in different planes of motion, will better (more functionally) strenghten your body overall and keep your body from adapting too quickly and you possibly plateauing in your fat loss efforts if that is one of your goals. 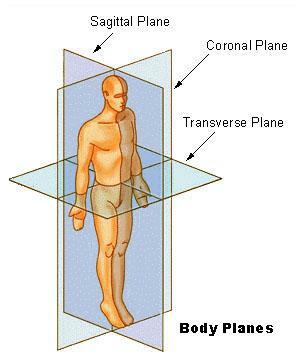 Using your whole body vs just your lower or upper body will challenge your body in ways that the machines just can’t do.Our muscles/muscle groups and joints are designed for different movements like adduction,abduction, circumduction and rotation,elevation and depression and so forth and these movements all occur in these different planes. Joint pain and muscle imbalances which create an array of postural problems and injuries are often seen in those who don’t train in a way that crosses the frontal, sagittal and transverse planes. Really you never truly are functioning in only one particular plane or axis of motion (unless of course you walk and dance like that girl in that episode of Seinfeld…u know which one I am taling about lol) but by paying particular attention to and focusing on the different ways to move more consciously in different planes and axies, you will do yourself a big favour towards positive progress and in prevention of imbalances and injuries.